To put this in context, since I was a teen, my mom, an older cousin, and I have been a little obsessed with a series of six books that describe the life of an orphaned girl whose parents were killed when she was five years old. She was found by a group of people who were very different from her family, yet they saved her life, took her in, and adopted her as one of them. With no way to return her to her people, they raised her to be one of them and accepted her as one of their own. How wonderful to be given food and shelter and love when you have lost everything that is familiar, everyone that you love, everything that you know. And yet, as hard as she tried, she could not be one of them. Not entirely. She learned their ways as best as she could, tried her hardest to fit in, but there were always certain differences that kept her from truly being one of them. Still, they accepted her, differences and all. It was sometimes difficult, at times painful, but they stuck by her through all her peculiarities, and though they couldn’t completely understand her and she couldn’t completely understand them, there was still love. I have often felt like an outsider among my own people. I have often struggled to understand the social niceties that others take for granted and labored to comprehend what most of the people around me pick up without effort. And yet, throughout my life, there have been people around me who have accepted me, despite my differences, despite my many faux pas and peculiarites. There was still love. Now I know that much of my struggle has been due to the fact that my brain processes some types of information differently than the majority, and this difference is called autism. Reading the Earth’s Children series over and over again, I strongly identified with this girl who never quite fit in. But it is more than that we both didn’t fit in. I identified with the character herself, and reading them all again after my diagnosis, I can finally articulate why. I am convinced that this girl, Ayla, and likely the author as well, are also autistic. Many of the descriptions of the character in a variety of situations, and certain elements of the author’s insights and writing style, display classic autistic traits. I use “autistic” here, and throughout my blog, in a positive, self-affirming way. I am aware that some people think of autism as a disease or a tragic fate, some even hurl the word about as an insult. I am using it very specifically as both a clinical diagnosis and a statement of personal pride and acceptance of who I am. No longer burdened by the guilt of not being able to fit in and being unable to understand why I couldn’t despite how courageously hard I tried my entire life. At the end of the first book, Ayla is forced to leave her home by the one person in her life who has never been able to accept her, who in fact hates her and has done his best to make her life miserable. She has to leave the only home she can remember, the people she has known as her family, is even forced to leave behind her young son, and walks off into the sunset, as it were, in search of people like her. For a little more context: if you are not familiar with author Jean Auel’s books, you may have been imagining this girl as a refugee or a war orphan, or that the story took place relatively recently. Nothing could be further from the truth. Ayla was a prehistoric Homo sapien whose parents died in an earthquake and was found and raised by a group of Neanderthals. Auel went to extreme lengths to make sure that every detail was as accurate as possible while building an engaging story. She immersed herself in all available historical and scientific data about ice age Europe, earning the respect of archeologists, anthropologists, and paleontologists worldwide, as well as four honorary degrees. In autism circles, this kind of devotion to a single subject over decades is called a “special interest.” Most people politely call it an obsession. Ayla does eventually find a group of her own people, and getting to know them is what the third book is all about. They are a group of mammoth hunters, and after so much time immersed in Auel’s stories, when I saw on the National Park Service website that a nursery herd of ice age mammoths had been discovered in Waco, Texas, and that I could visit and see them still in the ground, only partially excavated, I got tingly all over. It’s a small thing. Being able to see their bones. It’s not like I’d be allowed to touch them, and they wouldn’t be the same mammoths as in the story, but for those ice age hunters, the mammoth was like the whale to the Inuits or the olive in ancient Greece and Rome or like petroleum today: everything came from it. It powered their civilization. 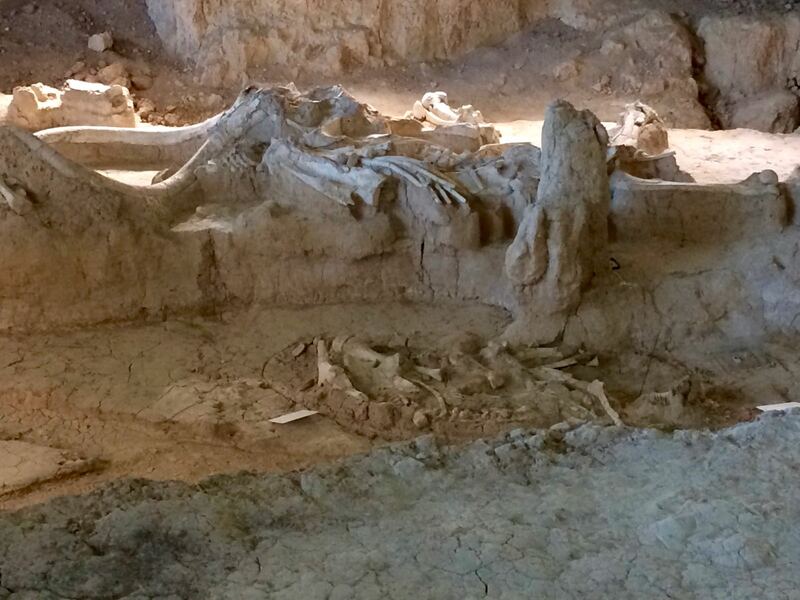 Getting close to these mammoths, getting a sense of where they lived, seeing their bones still in the earth where they died—it is not the same thing as stepping into one of the books, but it is still a connection. I had no idea that seeking a connection to this autistic character would lead me right into an “autistic moment” upon arriving. 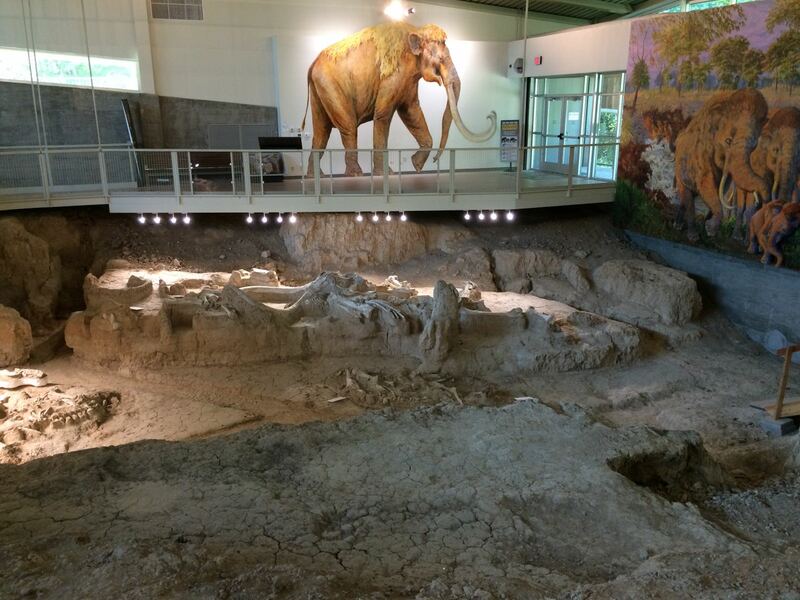 On the Waco Mammoth National Monument website, there is a page for operating hours, directions, etc. and one for fees and passes. I have an America the Beautiful pass, which gets me in to any national park for free, so I wasn’t concerned, but read the website thoroughly anyway, as usual. It explains that, although admission to the park is free for all, “access to the Dig Shelter is by guided tour only” and “National Park passes do not apply to guided tour fees” (emphasis theirs). 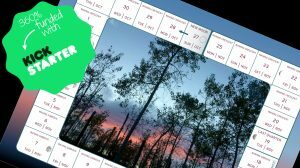 The webpage then goes on to explain in detail how to buy a national park pass, although it is entirely useless at this site. That is just rubbing salt in the wound. Because this is a wound. I’m angry. I have no problem, in principle, with supporting the dig site or the national park system, and it doesn’t matter that the guided tour is only $5, because the price isn’t the point. It feels like bait and switch. Like they’ve found a way around the park passes and are exploiting it. I feel like I am being conned, being made to pay twice for something, and that is why I am angry. I was angry enough that I considered not going at all. But Waco was directly on my route anyway, so I could head that direction and think about it for a week. Ultimately, I decided that it was important enough to me—see, they’ve got me over a barrel—to fork out the five bucks extra. So I got there, and admission to the grounds was indeed free, which basically means that there is no guard booth restricting entry. You can park and walk around and even walk their trails if you like, but the only thing anyone comes here to see, the mammoths, are in a building that does have restricted access. A smaller building by the parking lot houses the ranger’s office, bathrooms, gift shop, and ticket sales, and I went in to buy a ticket for the tour. I nurtured a sliver of hope that they would let me use my park pass, but they probably get that often enough to have a pat answer. I asked anyway. And no. I’d also been debating for a week whether I should bring up any of this, and though I was sure it would change nothing, it would give me some small satisfaction to hear them admit that it is purely a financial ploy. So I commented that it is very convenient that they’ve found a way around the park passes. And why is the guided tour required? That is where it all went downhill. Her answer was that the dig shelter is climate controlled, and the rangers are the only ones with keys to the building, so the rangers have to let the visitors in. What? You have got to be kidding me. That’s her answer??? This wasn’t some random lady who got coopted into selling tickets that day. She works there. She should have had a better answer prepared than that. I can’t be the only one to see through such an obvious scheme and ask about it. I mean, has she never wondered why herself? Has she never asked someone? And if that is the answer she was given, can she really believe that rubbish? They leave angry or hurt. I leave bewildered, having no idea what I did wrong. But see, here’s the personal growth. Since my diagnosis, I’ve begun to analyze interactions with people as carefully and intentionally as I would when sorting out a complex bit of German grammar or untangling a giant knot in a ball of yarn—both pastimes that I’ve devoted many happy hours to. But people are highly complex and no two react exactly the same, so there are an infinite number of possible variables to consider, and often the visible reactions disguise what is really going on inside a person, and to make matters worse, people are often unaware themselves of why they react the way they do, which is why social situations are so difficult for autistics to understand. But not impossible. With effort, many make impressive progress, and I am indeed getting better. Although there are infinite variables, there are also some pretty reliable patterns, and I am getting better at recognizing these. Which is why I know exactly how this conversation would go, in general outline, if not in specific details. And I just didn’t feel like going there right then. It wouldn’t alter my need to pay, convincing her wouldn’t change their policies, and I didn’t want to get upset right before something I had been looking forward to for a week. All of this went through my head during those two breaths, and instead of challenging her directly—although I can’t entirely let it go, either—I just muttered to myself, “Well, that’s blatantly stupid. Skipping that…” Then to the lady, in what I thought was a pleasant voice, “I’d like a ticket, please.” And held out my credit card. Oops. She heard me. Dang it. With a look that combined offense with confusion, she asked me what was stupid, making no move to take my money or get the ticket I had asked for. And there we were, right in the conversation I was trying to avoid. So I took a deep breath again and decided to try to make this as quick as possible. For me, however, quick usually means more direct, which for them usually means more offensive. See, I know how this works even though I still have difficulty changing tactics. I won’t reconstruct the entire conversation for you, but suffice it to say that she essentially kept repeating her points over and over, as did I, both of us just using slightly different words and talking right past each other, while she got more angry and I got more confused at her reaction. After about three rounds, I just stopped and asked again for a ticket. She gave it to me in a huff and told me the next tour would start right outside in a few minutes. It could have gone worse. It has. Many times. But because I was able to understand the pattern for the first time, and be somewhat detached and reflective, I left feeling much less confused, flustered, and stressed than I usually would have, and despite this lengthy post as evidence to the contrary, I didn’t brood over what happened nearly as much as I would otherwise have done. It didn’t go perfectly, but I still count this as personal growth. Now on to the mammoths. I’ve been listening to my favorite parts of Auel’s The Mammoth Hunters on audiobook to get into the spirit. The ranger who was leading our tour showed up a few minutes later, and I was slightly relieved to see it wasn’t the lady from the ticket desk. 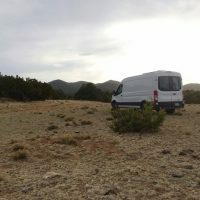 There were seven of us in my little tour group, and our ranger guide walked us down the path to the dig shelter, explaining about the megaflora and megafauna of the ice age, with grass regularly reaching eight feet high and giant armadillos as large as a Volkswagen Beetle. I’ve seen a few modern armadillos on the side of the road around here. They were about the size of a cat. And always belly up. Why is it that roadkill armadillos are always belly up? Do they just land that way? How does that work? I digress. “Ice age” is also a bit of a misnomer. The term describes the Pleistocene Epoch, when ice and glaciers were dominant, but the entire Earth was not covered by ice. Texas was at a southern enough latitude that there was no ice, and temperatures probably ranged in the 60-90º F range. Quite nice, actually, and similar to the day I was there, in the low 80ºs. The high temperatures would not have been comfortable for the wooly mammoth’s thick coats of hair, however. These were instead Columbian mammoths, who probably did not have much hair. We don’t know for sure, though, since without the ice to preserve tissue material, they have only ever found bones. Columbian mammoths were quite a bit larger than their wooly cousins, at 14′ instead of 10′ at the shoulders, and twice as heavy, weighing in at 20,000 lbs vs 10,000 lbs. They also boasted large tusks up to 16 feet long. To sustain their enormous bodies, each adult had to eat over 400 lbs of grass a day, about 150,000 calories, and produced about 300 lbs of poop, too. That’s a lot of fertilizer! Inside the dig shelter, a walkway guides visitors past the excavated remains. The life size wall mural to the left of the door is an artist’s interpretation of what these mammoths might have looked like. I came up to about the bottom of its belly. 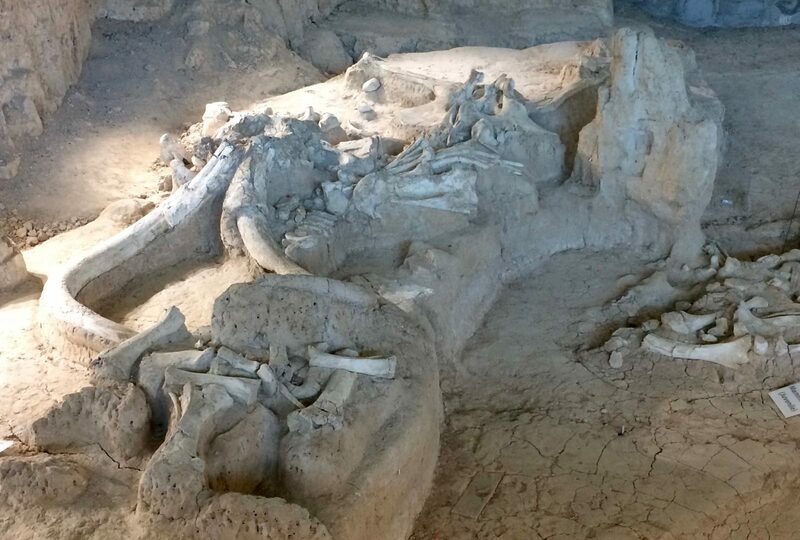 Most of the mammoths found at this site were a nursery herd, which means that it was a group of females and juveniles. This is a rare find and the archeologists were very excited about it. The herd of 16 mammoths was excavated entirely, their bones carefully packaged in plaster and removed to a university for study. 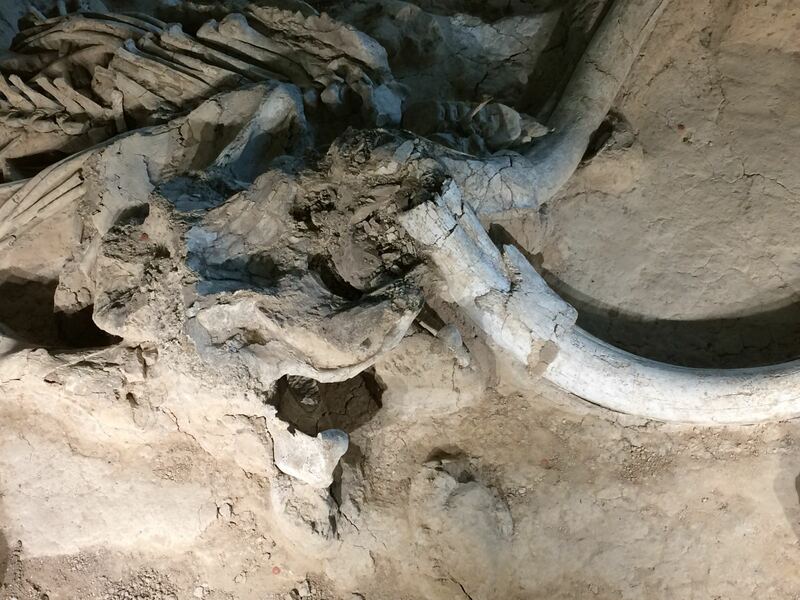 Then they found another mammoth a few feet away, and then another, six more in all, as well as the remains of a dwarf antelope, American alligator, giant tortoise, and the tooth of a juvenile saber-toothed cat, and there is likely more to find. According to the ranger, they didn’t have the funds to completely excavate them all, and there were some sort of bureaucratic issues involved, so for the time being, to preserve the bones that are very fragile once exposed, they built this building around the site. A handful of archeologists have continued to slowly excavate the site, but large scale efforts are on the back burner for now. The same mammoth as in the picture above, a male named Q, from the walkway view. On the far right is part of the skull of another mammoth. A side view of mammoth Q. 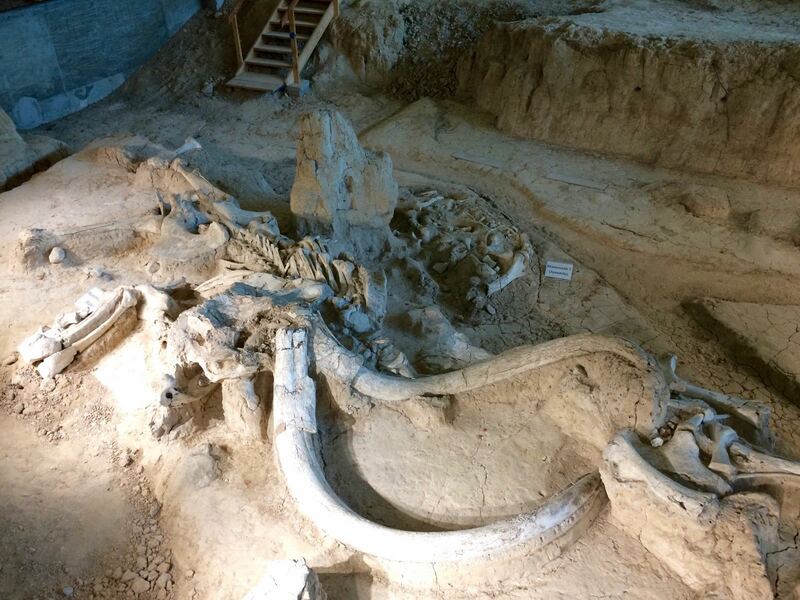 The group of bones below him is another mammoth that is less in tact and a few thousand years older. Experts are still debating how they might have died, with a leading theory being that a flash flood event trapped the herd. The valley was a natural flood plain, so this could have happened many times, accounting for the many well preserved remains in such a concentrated area. 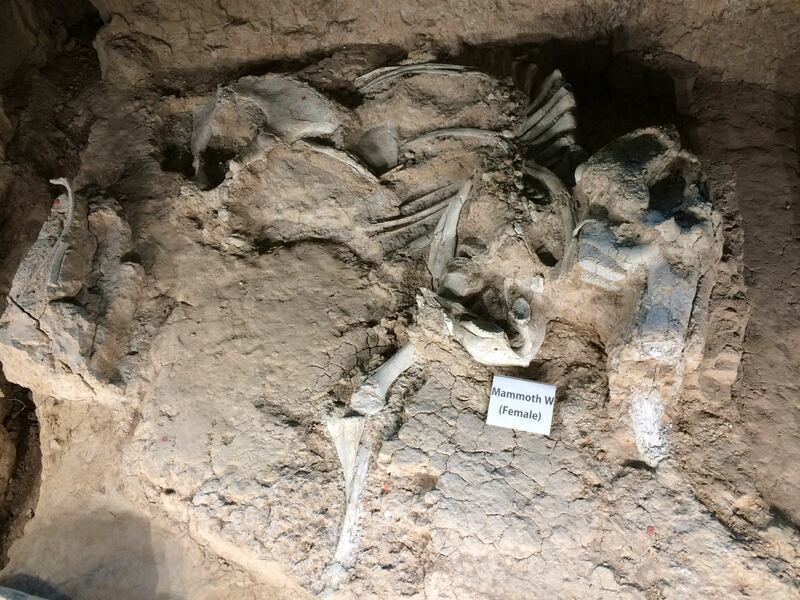 Dating the bones also shows that the remains are from a variety of time periods, although they are sure the nursery herd’s death happened in a single event. Our tour took about 40 minutes, and by the time we were done, the next tour group was coming in, since tours run every 30 minutes. I lingered a little, and ended up joining the next tour (I asked; the ranger was fine with it) and got almost the exact same information. They seem to be on a script. Both tours were well presented and informative, and I learned a lot. Another mammoth, a female named W.
One of the other visitors asked the ranger about the America the Beautiful passes—It’s not just me! The ranger sheepishly more-or-less conceded that it was a financial ploy. He explained that the park was part of the National Park Service, but the rangers themselves were employed by the county, and that is why they could collect fees for the tours. Uh hunh. Yep. Knew it was something like that. Thanks for admitting it. Someone in the other tour asked how busy the park gets, as there were only a few of us that day, besides a school group of 90 kindergartners that was finishing up around the time we were starting. The ranger answered that today was quite slow, and that during peak times, like spring break a few weeks back, they have one or two thousand visitors a day. So when they talk about climate control, they’re not worrying about the number of people coming through and all of our humidity and whatnot. And though we got a little speech about not bringing in food or drinks that could spill and damage the fossils, and don’t drop your cell phone down there, it won’t survive, this isn’t an overly exact climate control system. And with overlapping tours on the half hour, there is just about always a ranger in the building during operating hours anyway, so they could just post someone in there to keep an eye on the place and remind visitors about the no liquids policy, and put their nicely scripted information on “interpretive” signs, as museums like to call them. Half of it was already posted on signs anyway. So the ticket lady’s two points were indeed bunk. I point this out because I like to be right and because her points were stupid. Okay, invalid. Is that nicer? The human-guided tours were actually quite nice, I just don’t like feeling cheated. As I was getting ready to leave, another tour group was starting, and I overheard the new ranger, a young woman in her mid twenties, starting her spiel. She sounded particularly knowledgable, and gave a playful warning that she would be “geeking out” occasionally. I asked if I could join up. “Sure!” There were only five others, anyway. This young lady had clearly taken the initiative to learn much more on her own about both the site and the ice age in Texas than was part of the prepared script. 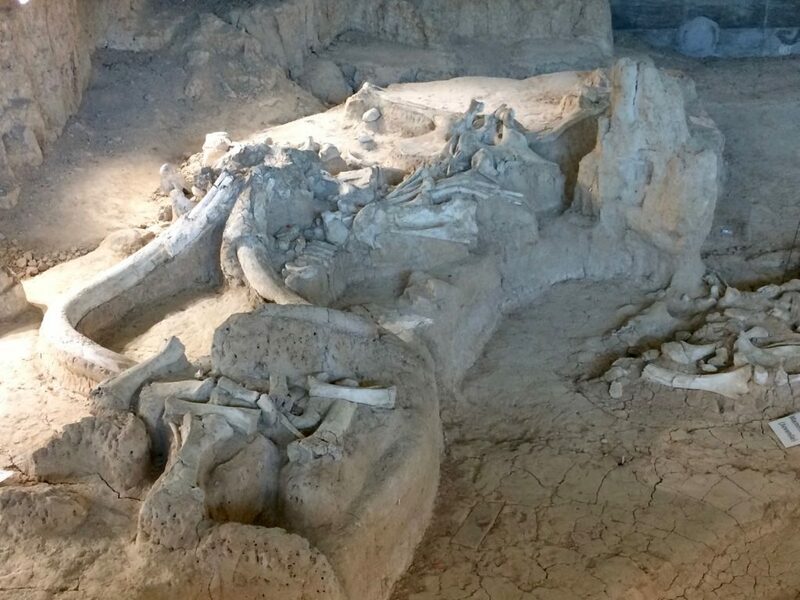 She pointed out much more detail in the bones, like where Mammoth Q’s skull was crushed in and the similar compressions on his ribs and a leg bone, where another mammoth walked over him when he was newly buried. With a little squinting, you can make out the mammoth shaped footprint in his skull. Can you make out that flattened indentation between the ribcage on the left and the base of the tusks on the right? 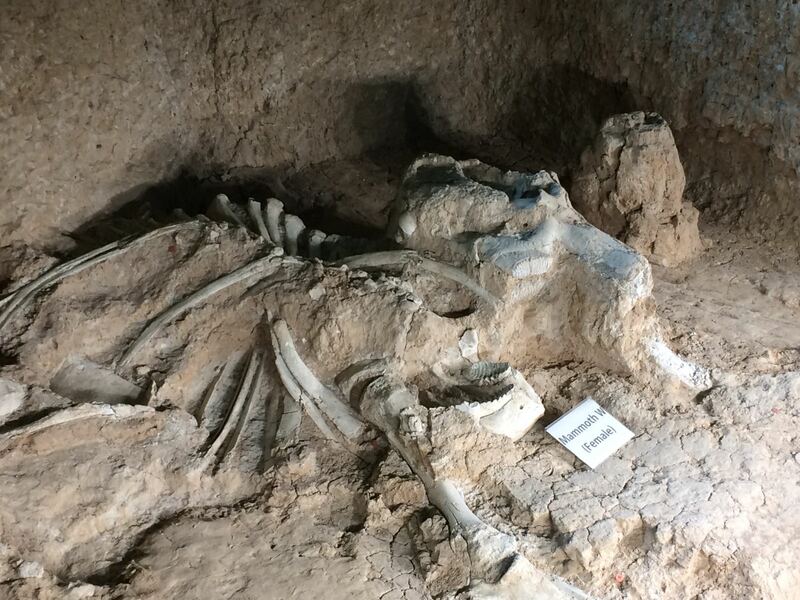 Another mammoth stepped on Q’s skull when he was newly buried. She also described the building itself, which is quite a remarkable piece of engineering. She is studying mechanical engineering, so this was right up her alley. The building was assembled on site from interlocking pieces that can be moved again to enlarge any section or wall as needed if more fossils are found. The walls go down into the bedrock, but there is no floor so as to cause minimum damage to any fossils still down there. The walkway, likewise, is supported from the ceiling, not the ground, to protect the fossils. She explained things very clearly, answering several questions I had from the earlier tours, and took obvious joy in how much she knew. It was fascinating for me just to watch her. As if as a model for what an autistic person could be like who fully accepts their quirks and themselves. For what it might look like to take joy in our differences instead of trying to hide or normalize them to fit in. Another view of mammoth W. Her head is on the right with the lower tusk barely visible in the ground, front leg pointing toward the bottom right corner, rib cage starting below the skull and going to the left. In the books, Ayla often felt like she didn’t fit in with the Neanderthals because she was a Homo sapien, and occasionally felt like she didn’t fit in among other Homo sapiens either, because of cultural differences she learned while being raised by Neanderthals. A consistent plot thread is her learning to accept herself for who she is rather than trying to conform too rigidly to the expectations of those around her. If only she could have seen this young Waco county ranger…I did, and was impressed. My own journey is about learning to accept my deepest self with love, not just because I’m autistic, but as a person. Ayla often intones the lesson of her adoptive father that it is difficult to live with a powerful totem like hers, the cave lion, because it sends many trials, but the lessons those trials teach are worth it. The lessons she learns are all about trusting her own inner strength and accepting herself for who she is. Learning to accept with love and not merely tolerate, is indeed a trial. May I, too, learn this lesson. I liked this post. Last week, I had a social interaction that reminded me of this. I didn’t say what I wish I had. I hid my reaction, took it submissively, and ended up crying about it privately later. Next time (because it’s a recurring scene) I’m going to speak up. Anita, thank you for having the courage to share. Identifying these recurring patterns of behavior, our scripts, if you will, is a crucial start to making improvements. I hope yours goes better next time.